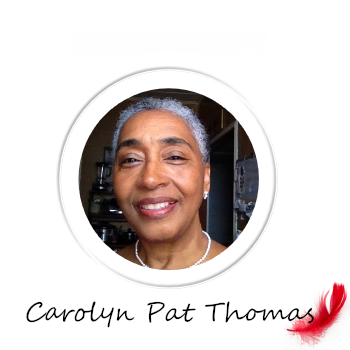 CAROLYN P.(PAT) THOMAS IS A DAUGHTER OF THE KING…OUR FATHER GOD IN HEAVEN.IN ADDITION TO HER LOVE FOR HIM IS A LOVE FOR HER HUSBAND OF OVER 42 YEARS, HER CHILDREN, GRANDCHILDREN AND GREAT-GRAND CHILDREN. PAT IS CURRENTLY FACILITATING A SENIORS’ GROUP AT HER CHURCH AND IS AN ASSISTANT LEADER OF A SMALL GROUP THAT MEETS WEEKLY FOR BIBLE STUDY. SHE IS AFFECTIONATELY KNOWN AND LOVED AS “MAMA PAT” BY MANY AT CORNERSTONE COMMUNITY CHURCH IN ORANGEBURG, SC WHERE SHE SERVES ON THE “FIRST IMPRESSION” TEAM AND SUPPORT HER HUSBAND, PASTOR FREEMON THOMAS, FAMILY CARE PASTOR. PAT LIVES IN ST. MATTHEWS, SOUTH CAROLINA AND IS A RETIRED HUMAN RESOURCES SPECIALIST WITH IBM WHERE SHE WORKED FOR 30 YEARS.